In vitro studies thus suggest that insulin may modulate Aβ release and degradation. It is unknown whether similar effects occur in humans. Insulin from the periphery crosses the blood–brain barrier via a receptor-mediated transport system, where it binds to brain insulin receptors in hippocampus and other brain regions.15-17⇓⇓ Peripheral and central administration of insulin has also been shown to affect various brain functions, including memory.18-22⇓⇓⇓⇓ Because insulin promotes release of Aβ,5 elevated brain insulin resulting from transport of insulin from the periphery may increase Aβ levels in extracellular compartments such as CSF. Similarly, elevated brain insulin may compete with Aβ as a target for IDE activity, thus inhibiting degradation of Aβ. To investigate insulin effects in vivo in humans, we examined differences in CSF levels of Aβ42 in normal older adults after IV infusion of insulin or saline. This study was approved by the Human Subjects Committee of the University of Washington, and written informed consent was obtained. Sixteen cognitively normal older adults participated (10 women, mean age 68.1 years, SD 7.7 years, range 60 to 81 years; 6 men, mean age 69.8 years, SD 10.1 years, range 55 to 81 years). All subjects were in good general health, had no subjective memory complaints, were normotensive (<135 mm Hg systolic and 90 mm Hg diastolic), and reported stable weight for at least 2 months prior to the study. Subjects were screened by medical history, physical exam, and EKG and by evaluation of serum electrolytes, glucose, renal and hepatic function tests, complete blood count, and thyroid function studies. Subjects also received screening with a Mattis Dementia Rating Scale (DRS), Logical Memory I and II Scales of the Wechsler Memory Scale–Revised, and Mini-Mental State Examination (MMSE). Subjects achieved normal scores on these measures and were judged to be cognitively normal by consensus of a physician and neuropsychologist after review of screening information. Participants were free of known past or present psychiatric disorders, alcoholism, severe head trauma, hypoxia, neurologic disorders, renal or hepatic disease, diabetes mellitus, chronic obstructive pulmonary disease, congestive heart failure, or cardiac arrhythmias. No subjects were taking medications intended to enhance cognition or to affect glucose regulation. On 2 separate mornings separated by at least 1 week (mean interval 19.3 days, SD 3.5 days), fasting participants arrived at the Clinical Research Unit of the VA Puget Sound Health Care System at 8:00 am. IV catheters were inserted for infusions and blood sampling. After participants rested with IV lines in place for a 30-minute habituation period, infusions were begun, consisting of saline or insulin (1.0 mU·kg−1·min−1). Insulin infusion was accompanied by variable infusion of dextrose (20%) to maintain plasma glucose levels of about 100 mg/dL. Half of the subjects were given saline on their first visit and insulin on their second visit. The remaining subjects were treated in the opposite order. Treatment order was double-blinded and randomly assigned according to a random numbers table; only the medical personnel overseeing the infusion were aware of each subject’s condition. The subject and all study personnel involved in administration and scoring of cognitive tests and measurement of assays were blinded to condition. Infusions continued throughout the experimental session, which lasted for about 120 minutes. After 90 minutes of infusion, a 15-minute cognitive test battery was administered. Participants were then placed in the lateral decubitus position. The L4-5 interspace was infiltrated with 1% lidocaine to provide local anesthesia. A 24G Sprotte atraumatic spinal needle (Dyna Medical Corporation, London, Ontario) was inserted, and 27 mL of CSF was withdrawn with sterile syringes. CSF samples were collected as 0.5-mL aliquots into prechilled polyethylene tubes, frozen immediately on dry ice, and stored at −70 °C until assay. Blood samples were obtained prior to beginning infusions, immediately prior to cognitive testing, and immediately following CSF acquisition. Plasma glucose was measured at 5- to 10-minute intervals throughout each experimental session with a glucose oxidase method using a glucose analyzer (Beckman Instruments, Fullerton, CA). Two comparable versions of the cognitive protocol were constructed and assigned in counterbalanced order. Each protocol included a declarative memory measure (story recall),3,20,21⇓⇓ a measure of general orientation and cognitive abilities (MMSE),23 and a measure of selective attention (Stroop Color–Word Interference). Story recall, modeled after one of the most sensitive indicators of memory loss in early stages of AD,24 consisted of a brief narrative containing 44 informational bits. Subjects were asked to recall as much information as possible both immediately and after a 10-minute delay. Credit was given for each informational bit recalled verbatim or for accurate paraphrases. The Stroop Color–Word Interference Test included three conditions.25 In the first two conditions, subjects were asked to read color names and to name color patches. In the interference condition, subjects were required to name the ink color of color names printed in discordant colors (e.g., the word “red” printed in the color blue). We recorded time to complete the task and number of errors for each condition. Plasma and CSF insulin were measured with radioenzymatic or -immuno assays as described previously.15,26⇓ Values for plasma samples obtained prior to and following CSF aquisition were averaged to obtain a single, maximally reliable measure. CSF Aβ42 was measured using ELISA techniques (Athena Diagnostics, Worcester, MA). Cognitive scores and metabolic values were log transformed and then subjected to repeated measures analysis of covariance with infusion type (saline or insulin) as the within-subjects factor. We included age as a covariate because insulin metabolism changes with age. Planned analyses contrasted log-transformed values obtained with the insulin infusion vs saline treatment. The relationship between changes in Aβ42 levels in response to the insulin infusion and other variables was examined using regression analysis to create residual scores from the log-transformed values, with Aβ42 levels during saline infusion as the independent variable and Aβ42 levels during insulin infusion as the dependent variable. In this manner, the variance due to levels in the saline condition was removed from the values obtained following the insulin infusion, leaving a residual score that reflected the effects of treatment with insulin. Larger residual scores thus reflected greater increases in Aβ42 in response to the insulin infusion. Similarly, regression analysis was used to create residual scores from the log-transformed memory values, with story recall score during saline infusion as the independent variable and recall scores during insulin infusion as the dependent variable. For analyses in which age was a significant effect in the model, the nature of the relationship was examined with regression or correlation or both and by dividing the sample into an older and younger subgroup at its median. Subjects’ age, education, body mass index, and fasting plasma glucose are presented in the table. 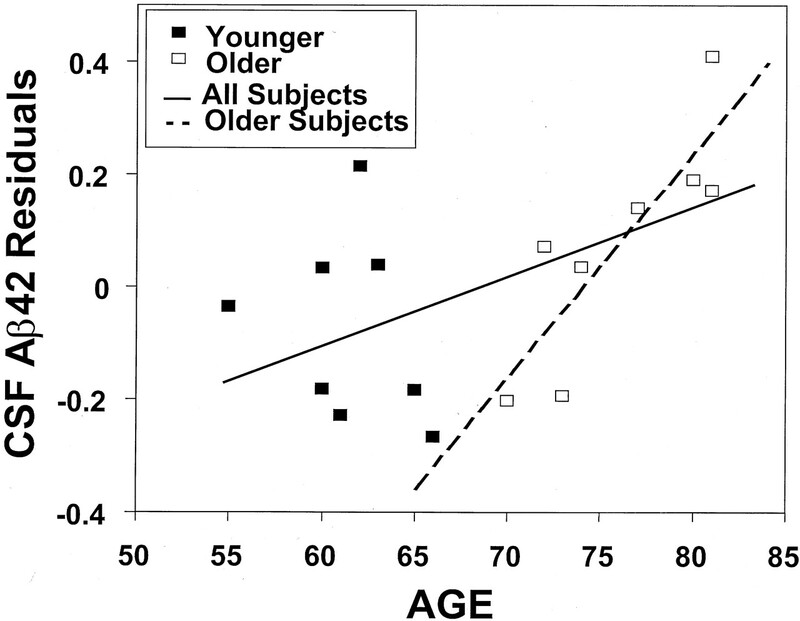 No differences in these values or in cognitive screening variables (DRS, MMSE) were observed between older and younger subjects (see the table). Infusions resulted in plasma insulin levels of 9.7 μU/mL (saline) and 72.4 μU/mL (insulin) and plasma glucose levels of 106.8 mg/dL (saline) and 100.8 mg/dL (insulin). CSF insulin levels also increased in response to the insulin infusion (F1,14 = 7.64, p = 0.02; mean saline CSF insulin levels, 1.47 pmol/L, SD 0.84 pmol/L; and mean insulin CSF insulin levels, 2.29 pmol/L, SD 0.69 pmol/L), consistent with previous animal work demonstrating transport of insulin from periphery into brain parenchyma and then into CSF.15,16⇓ Age was unrelated to CSF insulin levels. CSF Aβ42 levels increased with insulin infusion, as reflected in a overall effect of infusion type (F1,13 = 7.76, p = 0.02). Older subjects demonstrated a greater increase in CSF Aβ42 with insulin infusion, resulting in a age-by-insulin level interaction (F1,13 = 8.66, p = 0.01). We first examined the relationship between age and CSF Aβ42 changes on a post hoc basis by dividing the sample at its median into a younger (<70 years old) and an older group. As is shown in figure 1, older subjects’ CSF Aβ42 levels were higher with insulin than with saline infusion, whereas younger subjects showed little change in CSF Aβ42 levels, resulting in an infusion type-by-age group interaction (F1,14 = 5.31, p = 0.04). For older subjects, CSF Aβ42 levels were higher following insulin infusion than following saline infusion (F1,7 = 5.54, p = 0.05). We next examined the correlation of age with change in Aβ42 levels after insulin infusion as reflected by the residual scores. Increasing age predicted greater increase in CSF Aβ42 with insulin infusion (figure 2; r = 0.53, p = 0.04). The correlation increased when older subjects (≥70 years old) were considered separately (r = 0.85, p = 0.008). The pattern and magnitude of the relationships between age and Aβ42 changes remained essentially identical when age was adjusted for Aβ42 levels during the saline condition. For older subjects, greater increases in CSF insulin levels in response to the insulin infusion predicted greater increases in CSF Aβ42 levels (r = 0.76, p = 0.05). 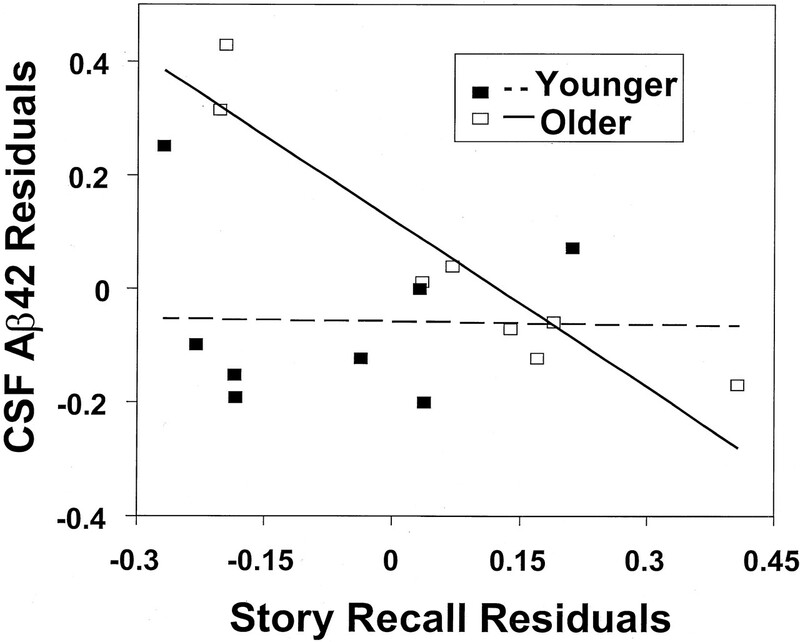 No significant correlation between Aβ42 residual values and age was observed for subjects younger than 70 years (r = −0.28, p = 0.51). Figure 1. Mean log CSF β-amyloid protein (Aβ42) values with SE for younger and older subjects during saline (white columns) and insulin (black columns) infusions. Older adults showed an increase in Aβ42 levels with insulin infusion (p = 0.05), whereas younger subjects showed little change. 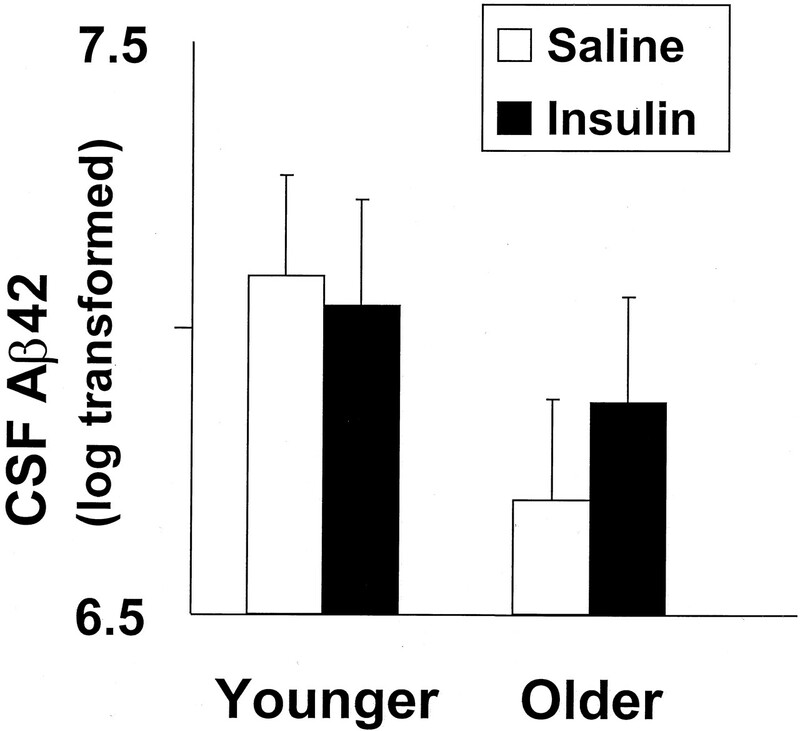 Actual mean (SE) CSF Aβ42 values for older subjects were 972.8 (224.6) pg/mL during the saline infusion and 1,127.4 (224.2) pg/mL during the insulin infusion, whereas corresponding values for younger subjects were 1,253.8 (140.6) pg/mL and 1,191.9 (128.0) pg/mL. Figure 2. Relationship of age and residual values reflecting insulin-induced changes in CSF levels of β-amyloid protein (Aβ42). Filled squares represent subjects aged <70 years, and open squares represent subjects aged ≥70 years. The solid line shows the correlation for the entire sample (r = 0.53, p = 0.0348). The dashed line shows a far stronger correlation among those aged ≥70 (r = 0.85, p = 0.0078), indicating that older subjects had greater increases in CSF Aβ42 levels following insulin infusion. No effect of insulin condition on memory delay was observed (p = 0.90); thus, immediate and delay values were summed into a single memory index. Consistent with previous studies, memory performance improved for the group as a whole with insulin infusion compared with saline infusion (F1,13 = 4.38, p = 0.04; mean log and raw memory scores with saline, 3.6 and 40.5, SE, 0.1 and 2.8; mean log and raw memory scores with insulin, 3.8 and 44.7; SE, 0.1 and 2.9). Residual scores were then constructed using scores with saline infusion as the independent variable and scores with insulin infusion as the dependent variable. The relationship between insulin-induced changes in memory and Aβ42 was explored with regression analysis using memory residual scores as the dependent variable, Aβ42 residual values as the independent variable, and age as a covariate. Aβ42 residual values reflecting change with insulin infusion were related to memory residual values. The R2 value of 0.62 for the model was significant (p = 0.007) and included an interaction with age (p = 0.008). As can be seen in figure 3, older subjects with greater increases in Aβ42 with insulin, as reflected by larger residual values, had reduced insulin-induced memory facilitation (r = −0.95, p = 0.0002). Little relationship was observed for younger subjects (r = −0.02, p = 0.96). Comparison of the r values using a Fisher r-to-Z transformation revealed a difference between the two groups (Z = 2.685, p = 0.004). No changes were observed following insulin infusion for the Stroop or MMSE (data not shown). Older and younger groups had similar ordering of conditions, and no effects were observed for order of conditions for any measure. Figure 3. Correlation of residual values reflecting insulin-induced change in memory with residual values reflecting insulin-induced changes in CSF levels of β-amyloid protein (Aβ42). Filled squares represent subjects aged <70 years, and open squares represent those ≥70 years. The dashed line shows a strong correlation among those aged ≥70 years (r = −0.95, p = 0.0002), indicating that greater increases in CSF Aβ42 were associated with reduced memory performance after insulin infusion. Little relationship was observed for younger subjects (r = −0.02, p = 0.9578). In the current study, the association of increased CSF Aβ42 with increased CSF insulin concentration after insulin infusion was strengthened markedly with age. This pattern may reflect a greater vulnerability of older adults to the effects of insulin on Aβ42 degradation or release. There was no relationship between age and CSF Aβ42 levels with saline infusion, however. Thus, to the extent that CSF and brain Aβ42 levels are correlated, the effects of insulin do not seem to be due to the increased availability of Aβ42. Furthermore, recent studies of large numbers of normal adults and those with AD have shown no relationship between Aβ42 levels and age.27,28⇓ Given the well-established finding of increased risk for AD with age, it is also possible that the tendency for older adults to show increased Aβ levels in response to insulin reflects incipient AD that could not be detected with our cognitive screening tests. Although patients with established AD reliably show lower CSF Aβ42 levels than do normal adults (a pattern presumably due to decreased clearance of Aβ from brain), some studies suggest that prodromal AD is characterized by transiently higher CSF Aβ42 levels.29 This area remains controversial, however, as other studies suggest that lower Aβ42 levels are associated with incipient AD.30 The current study was unable to characterize insulin effects on Aβ40, whose release and inhibition are also affected by insulin in in vitro studies, because we used highly reliable commercially available assays by Athena Diagnostics, which measure only the longer species of Aβ. Thus, insulin may not selectively affect Aβ42. Consistent with previous studies, we found that insulin administration was associated with increased memory performance.18,22⇓ Interestingly, however, our subjects with higher CSF Aβ42 levels following insulin infusion showed attenuated insulin-induced memory facilitation. The significance and cause of this unexpected finding remain unknown, and any potential explanations must be considered speculative at the current time. It is possible, however, that in younger adults, release of Aβ42 is followed by its rapid and efficient clearance such that CSF Aβ42 levels do not change measurably. For some older adults, however, Aβ42 is not cleared quickly, and sustained elevations may occur that interfere with memory facilitation. Thus, for older adults with ineffective clearance mechanisms, as signified by higher Aβ42 levels, insulin’s enhancement of memory is opposed, resulting in an inverse relationship between insulin-induced memory facilitation and CSF Aβ42 levels. Several recent reports have also described inhibitory effects of peripheral and intracerebroventricular Aβ42 administration on memory in rodents. For example, raising Aβ42 to levels that do not affect viability of cortical neurons results in suppressed phosphorylation of cyclic AMP-response element binding protein and interferes with downstream events such as activation of brain-derived neurotrophic factor.31 These effects are apparent within an hour of Aβ42 administration, although it is difficult to judge how the Aβ42 increases in such studies compared with those we observed. It has been proposed that soluble Aβ assemblies disrupt memory acutely, purportedly through effects on long-term potentiation.32,33⇓ Taken together, these findings are consistent with the possibility that elevations in Aβ42 that are not lethal in neurons, such as those provoked by hyperinsulinemia in the current study, may disrupt cellular functions related to memory, perhaps contributing to impaired memory prior to the formation of senile plaques. This study suggests that acutely increasing Aβ42 levels may be associated with reduced memory performance in humans. Our results can be fit into a model of insulin’s potential role in AD pathophysiology. For normal healthy adults, moderate levels of insulin are secreted in response to a glucoregulatory or neuroendocrine signal. Insulin initiates a variety of neurobiological events that may include Aβ release and memory-related neural processes. Insulin is then quickly cleared, permitting precise temporal control of its signal and allowing the rapid subsequent clearance of released Aβ. Dysregulation of insulin metabolism due to genetic or environmental mechanisms may result in chronic high levels of insulin coupled with reduced insulin activity. This pattern has been identified in some adults with AD.3,4⇓ In such circumstances, insulin’s effects on intracellular Aβ release may be abrogated, IDE activity may be chronically reduced, and IDE-mediated Aβ clearance may be inhibited. Additionally, the role of insulin in memory processing may be impeded, either through reduction of insulin’s receptor-mediated effects or through other mechanisms related to chronic Aβ elevations that may impair memory, thereby contributing to the clinical symptoms of AD. Older adults may be particularly vulnerable to deleterious effects of Aβ42 on memory, because reduced clearance of insulin increases the likelihood of prolonged Aβ42 elevations. Although it is likely that abnormal insulin metabolism characterizes only a subset of adults with late-onset AD, our model may provide a heuristic for investigating a novel class of risk factors and mechanisms relating to AD pathophysiology. Our results show that insulin provokes an acute increase in CSF Aβ42 levels for normal older adults. Although confirmation with a larger sample would be desirable, these results suggest that Aβ42 levels can be modulated acutely in vivo in humans and that such modulation may be related to memory performance. Further study is needed to determine whether insulin is affecting the release or clearance of Aβ and to identify other mechanisms whereby insulin may be contributing to the pathophysiology of AD. Supported by Department of Veterans Affairs, NIA grant RO1 AG10880 (S.C.) and NIH grant T32 AG00258 (G.S.W.). The authors thank Pam Asberry, RN, for excellent technical assistance and John C. S. Breitner, MD, MPH, for his helpful comments. Leibson C, Rocca W, Hanson V, et al. The risk of dementia among persons with diabetes mellitus: a population-based cohort study. Ann NY Acad Sci . 1997; 826: 422–427. Stolk RP, Pols HA, Lamberts SW, de Jong PT, Hofman A, Grobbee DE. Diabetes mellitus, impaired glucose tolerance, and hyperinsulinemia in an elderly population. The Rotterdam Study. Am J Epidemiol . 1997; 145: 24–32. Craft S, Asthana S, Schellenberg GD, et al. Insulin metabolism in Alzheimer’s disease differs according to apolipoprotein E genotype and gender. Neuroendocrinology . 1999; 70: 146–152. Craft S, Peskind E, Schwartz MW, Schellenberg GD, Raskind M, Porte D. Cerebrospinal fluid and plasma insulin levels in Alzheimer’s disease: relationship to severity of dementia and apolipoprotein E genotype. Neurology . 1998; 50: 164–168. Gasparini L, Gouras GK, Wang R, et al. Stimulation of β-amyloid precursor protein trafficking by insulin reduces intraneuronal β-amyloid and required mitogen-activated rotein kinase signaling. J Neurosci . 2001; 21: 2561–2570. Authier F, Posner BI, Bergeron JJM. Insulin-degrading enzyme. Clin Invest Med . 1996; 19: 149–160. Kurochkin IV, Goto S. Alzheimer’s B-amyloid peptide specifically interacts with and is degraded by insulin degrading enzyme. FEBS Lett . 1994; 345: 33–37. McDermott JR, Gibson AM. Degradation of Alzheimer’s beta-amyloid protein by human and rat brain peptidases: involvement of insulin-degrading enzyme. Neurochem Res . 1997; 22: 49–56. Qiu W, Walsh D, Ye Z, et al. Insulin-degrading enzyme regulates extracellular levels of amyloid beta-protein by degradation. J Biol Chem . 1998; 273: 32730–32738. Vekrellis K, Ye Z, Qiu WQ, et al. Neurons regulate extracellular levels of amyloid B-protein via proteolysis by insulin-degrading enzyme. J Neurosci . 2000; 20: 1657–1665. Sudoh S, Frosch MP, Wolf BA. Differential effects of proteases involved in intracellular degradation of amyloid β-protein between detergent-soluble and -insoluble pools in CHO-695 cells. Biochemistry . 2002; 41: 1091–1099. Edbauer D, Willem M, Lammich S, Steiner H, Haass C. Insulin-degrading enzyme rapidly removes the β-amyloid precursor protein intracellular domain (AICD). J Biol Chem 2002;. Perez A, Morelli L, Cresto JC, Castano EM. Degradation of soluble amyloid B-peptides 1–40, 1–42, and the Dutch variant 1–40Q by insulin degrading enzyme from Alzheimer disease and control brains. Neurochem Res . 2000; 25: 247–255. Cook DG, Leverenz J, Ericksen S, et al. Reduced hippocampal insulin degrading enzyme in late onset Alzheimer’s disease is associated with the apolipoprotein E-ε 4 allele. Am J Pathol . 2003; 162: 313–319. Baskin D, Figlewicz D, Woods S, Porte D, Dorsa D. Insulin in the brain. Annu Rev Physiol . 1987; 49: 335–347. Baura GD, Foster DM, Porte D Jr, et al. Saturable transport of insulin from plasma into the central nervous system of dogs in vivo. A mechanism for regulated insulin delivery to the brain. J Clin Invest . 1993; 92: 1824–1830. Schwartz MW, Figlewicz DP, Baskin DG, Woods SC, Porte D. Insulin in the brain: a hormonal regulator of energy balance. Endocr Rev . 1992; 13: 387–414. Craft S, Asthana S, Newcomer JW, et al. Enhancement of memory in Alzheimer’s disease with insulin and somatostatin, but not glucose. Arch Gen Psychiatry . 1999; 56: 1135–1140. Park CR, Seeley RJ, Craft S, Woods SC. Intracerebroventricular insulin enhances memory in a passive-avoidance task. Physiol Behav . 2000; 68: 509–514. Craft S, Asthana S, Cook DG, et al. Insulin dose–response effects on memory and plasma APP in Alzheimer’s disease: interactions with ApoE genotype. Psychoneuroendocrinology, in press. Craft S, Newcomer J, Kanne S, et al. Memory improvement following induced hyperinsulinemia in dementia of the Alzheimer type. Neurobiol Aging . 1996; 17: 123–130. Kern W, Peters A, Fruehwald–Schultes B, Deininger E, Born J, Fehm HL. Improving influence of insulin on cognitive functions in humans. Neuroendocrinology . 2001; 74: 270–280. Folstein MF, Folstein SE, McHugh PR. “Mini-Mental State.” A practical method for grading the cognitive state of patients for the clinician. J Psychiatr Res . 1975; 12: 189–198. Storandt M, Hill RD. Very mild senile dementia of the Alzheimer’s type II. Psychometric test performance. Arch Neurol . 1989; 46: 383. Perret E. The left frontal lobe of man and the suppression of habitual responses in verbal categorical behavior. Neuropsychologia . 1974; 12: 323–330. Kahn SE, Leonetti DL, Prigeon RL, Boyko EJ, Bergstrom RW, Fujimoto WY. Relationship of proinsulin and insulin with noninsulin-dependent diabetes mellitus and coronary heart disease in Japanese–American men: impact of obesity. J Clin Endocrinol Metab . 1995; 80: 1399–1406. Mehta PD, T. P, Patrick BA, Barshatzky M, Mehta SP. Amyloid beta protein 1–40 and 1–42 levels in matched cerebrospinal fluid and plasma from patients with Alzheimer’s disease. Neurosci Lett 2001;304:102–106. Sjogren M, Blomberg M, Jonsson M, et al. Neurofilament protein in cerebrospinal fluid: a marker of white matter changes. J Neurosci Res . 2001; 66: 510–516. Andreasen N, Blennow K. β-Amyloid (Aβ) protein in cerebrospinal fluid as a biomarker for Alzheimer’s disease. Peptides . 2002; 23: 1205–1214. Tong L, Thornton PL, Balazs R, Cotman CW. β-Amyloid-(1–42) impairs activity-dependent cAMP response element-binding protein signaling in neurons at concentrations in which cell survival is not compromised. J Biol Chem . 2001; 276: 17301–17306. Westerman MA, Cooper–Blacketer D, Mariash A, et al. The relationship between Aβ and memory in the Tg2576 mouse model of Alzheimer’s disease. J Neurosci . 2002; 22: 1858–1867. Wang H-W, Pasternak JF, Kuo H, et al. Soluble oligomers of β amyloid (1–42) inhibit long term potentiation but not long term depression in rat dentate gyrus. Brain Res . 2002; 924: 133–140.